Octavia E. Butler burst onto the science fiction literary scene with the publication of her first novel, The Patternmaster, in 1976. Her work continued to transform and develop the field in remarkable ways until her death in 2006. From creating worlds of powerful telepaths, alien beings looking to “trade” with humans to advance their civilization or creating a religion that fosters and encourages its followers to believe that “God is change,” Butler’s talent is astounding and groundbreaking. In The Parable of the Sower Octavia Butler creates a new religion, Earthseed. Earthseed is based on the concept that God is change, that change is the only true constant in this world. The goal of Earthseed is to “take root among the stars.” Earthseed is a pragmatic religion that allows its followers to take active control of their lives in a way that provides them with support and community. While the concept of change runs throughout all of Butler’s work, it is in The Parable collection that she solidifies it. Religious beliefs and practices in alternative concepts of subjectivity including gender, sexuality, species, etc. Abstracts are due by July 1, 2018. Please email abstracts as word documents to scrosby1@memphis.edu or aparananda@berkeley.edu. Those folks chosen to participate in the collection will be notified by August 15th with a final draft due March 15th. Editors Gregory J. Hampton (Howard University) and Kendra R. Parker (Hope College) are seeking submissions for The Bloomsbury Companion to Octavia E. Butler. This book will be a collection of literary criticism and theory by an international range of contemporary scholars exploring major themes across the full span of Octavia Butler’s writing. We welcome essays that survey past and current scholarship on Butler; however, we are most interested in work that will point forward to new directions and new agendas in Butler scholarship on both domestic and international levels. Abstracts of no more than 500 words and a brief CV should be emailed to Gregory J. Hampton (ghampton@howard.edu) and Kendra R. Parker (parker@hope.edu) as a Microsoft Word document no later than October 1, 2017. Invitations for full papers will be sent by November 15, 2017, and completed essays (6,000-8,000 words) are expected by May 14, 2018. The editors invite submissions that respond to the focus of the volume and also welcome general inquiries about a particular topic’s suitability. Please submit 250 word abstracts, a working bibliography, and a brief CV electronically as MS Word attachments to Isiah Lavender III at isiahl@lsu.edu and to Lisa Yaszek at lisa.yaszek@lmc.gatech.edu by July 30, 2016. Accepted articles should be between 5000 and 6500 words in length, including “Works Cited,” and prepared in MLA style, and forwarded as MS Word attachments. Registration for the Conference is now open. All attendees must register for the conference. All panelists and presenters must also be members of the OEB Society by December 1, 2015. Click here to join the society. Click here to register. February 24, 2016 will mark the tenth anniversary of the passing of Octavia E. Butler. 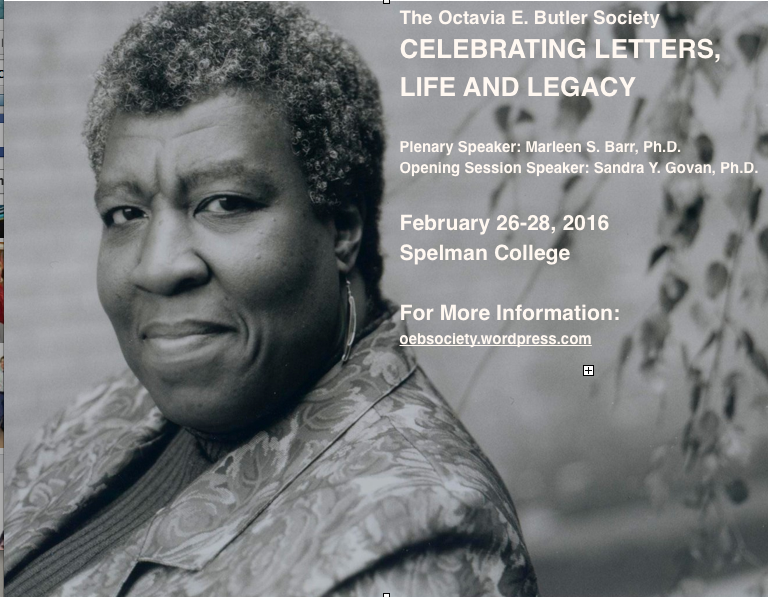 To commemorate her contributions to the world of letters, the Octavia E. Butler Society solicits papers for a special conference to be hosted by Spelman College February 26-28, 2016. The Society welcomes proposals of 250 words focused on any aspect of Butler’s life, work, and influence. Because a major goal of the Society is to encourage the teaching of her works in the academy and beyond, we also invite submissions addressing approaches to teaching Butler in any pedagogical environment. Panel proposals are also encouraged. This inaugural conference is especially geared toward conversation and collaboration so submissions that move beyond the traditional conference paper are also welcome. Please submit proposals to oebliterarysociety@gmail.com by Monday, September 21, 2015. The Octavia E. Butler Society invites abstracts (of no more than 300 words) for presentations at the annual conference of the ALA (http://alaconf.org/annual-conference/). Please note that we can only accept proposals for individual papers and will not be able to accept proposals for entire panels. We invite paper proposals on Octavia Butler and all aspects of her work. We particularly invite papers on Fledgling, as 2015 marks the 10th anniversary of that novel. Please send abstracts to Conseula Francis (francisc@cofc.edu) by January 2, 2015. Please adhere to the following format: 1. Identify email subject as follows: OEB Submission 2015 – [Your Last Name]; 2. Save Abstracts as Word Doc and include Name, Bio, Paper Title and Abstract within the word.doc. The Guelph Jazz Festival, in conjunction with the Macdonald Stewart Art Centre, the University of Guelph, and the SSHRC funded International Institute for Critical Studies in Improvisation (IICSI) invites proposals for presentations at our annual three ‐ day international interdisciplinary conference. This year’s colloquium will take place September 3rd to 5th as part of the 21st annual Guelph Jazz Festival (September 3-7). It will bring together a diverse range of scholars, creative practitioners, arts presenters, policy makers, and members of the general public. Featuring workshops, panel discussions, keynote lectures, performances, and dialogues among researchers, artists, and audiences, the annual colloquium cuts across a range of social and institutional locations and promotes a dynamic international exchange of cultural forms and knowledges. The OEB Society is calling for founding members to join the society. Please visit the membership page for details. The Society created a group at MLA Commons titled Octavia Butler. If you are a member of the Modern Language Association join our group on the commons and discuss the ways you are using Octavia Butler in the classroom. The OEB Society sponsored a panel at the Utopian Studies Conference in Charleston, SC November 2013, entitled Race/Ethnicity in Film and Literature. Cool society theme, so who is adapting a script of any of Ms Butler’s books? John Jennings is working on a graphic novel of Kindred. oh that’s cool I just clicked on the link below Mr Jennings name. I asked about a script because I too am a writer and am working on an adaptation of one of Ms. Butler’s books. The one she said she wrote as a gift to herself.